Check out crazy set photos and videos for the Captain America sequel! Plus Dominic Cooper is weirdly confused about the role Howard Stark plays in The Winter Soldier. There's a Pacific Rim featurette, an R.I.P.D. 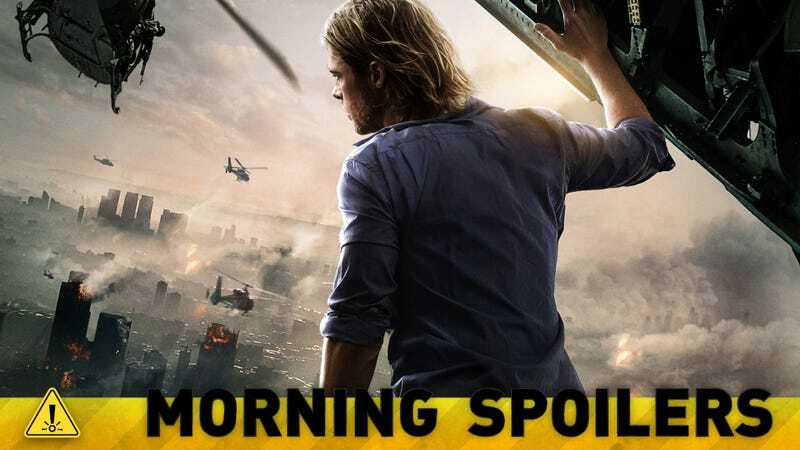 trailer, and a World War Z clip. David Goyer explains how Man of Steel could pave the way for Justice League. Harry Potter's Emma Watson may have found a new fantasy franchise. Spoilers! Top image from World War Z. It is our intention that, in success, this would be the zero issue and from this point onward, possible films could expand into a shared universe. In our world, the Man of Steel world, Zack has gone on record saying that we’re implying there are other superheroes in this world. But I don’t know that they’ve come forward yet. The idea is that Superman is the first one. There might be people helping people, but not in costumes, and that Superman comes forward and announces himself to the world. In him announcing himself, he’s the one that changes things. "Well, I kind of am, I never know what to say about this. But I have definitely put the costume on. I have worn the costume and we have shot something, but how it's going to enter into the next phase of what they are planning I don't know. I sound so dodgy, I don't even believe myself! I have shot some scenes. I went off and shot something, but I can't even work out how my character can be in it; wouldn't I be dead? But anything is possible. They are quite secretive about where they are going to go with the characters and how it will slot in, you have no idea. So you turn up, put your costume on and do as you are told." Here's the latest in-depth featurette exploring the movie's universe. This one is entitled "Robot Concepts." Here's another sneak peek clip. Set three centuries after a small portion of the human race has populated a landmass that mysteriously emerged in the wake of an environmental catastrophe, the series follows nineteen-year-old princess Kelsea Glynn, who must reclaim her deceased mother’s throne and redeem her kingdom, the Tearling, from forces of corruption and dark magic of The Red Queen, the sorceress-tyrant of the neighboring country, Mortmesne. Here's the international trailer, which features a bit of footage not seen in the original domestic trailer. Yeah, they're working right now to finish it up. With visual effects, I mean, honestly we moved our [release] date to March because we literally had no materials ready to show because we were doing the visual effects and for how "300ey" it is — every single thing is green screen and there's just nothing… Now, a lot of movies you see early footage and a lot of the stuff there's real footage that they shot against whatever, but we just don't have any of that, so it was really lucky that we were able to move it back to March, which is the "300" date normally. "I'm very happy that the studios want me to be in 'Terminator 5' and to star as the Terminator... we start shooting in January and I'm also going to do 'King Conan'. To play that role and also to do another 'Twins' movie. I feel very proud of that. I feel very happy and I'm looking forward to doing those films." It basically opens with the idea that since The Avengers things have changed. Now everybody knows that there are gods and monsters, and what is the world like? It's about being the people who aren't super and what it is like for them. There will be people with powers and there will be exciting otherworldly mysteries and all that good stuff, but it's all in the service of finding the humanity of the thing. And [Agent] Coulson was that in the movies; he was the voice of us, the one who says, "I don't know what's going on - these guys are super, they're from this other place… but we're dealing with it." Clark Gregg, who plays Agent Coulsen in The Avengers and is also in Much Ado, is the star? How are they all going to influence each other? Emma has magic and some people on that boat wield magic, but they're not good influences. How are they going to work together? How are they going to get along?... It's about taking new lands, like Neverland, and using it as a way to open up our characters and dive deeper; taking the villains and heroes and throwing them together and forcing them to a common goal as a method for us to dig deeper and find out more about what makes them tick. It's really about this journey and it's really about these characters and we really want to dive back into our core characters. There's things left to be explored. Like Emma last year found out she had magic. She's not had a moment to contemplate why. So for us, another question for Emma is: She saved everyone else' happy endings, but what about her own? We really want to dive into these characters. I want to know more about Prince Charming. He was really good with a sword, but he was a shepherd. Well, there's a chance he probably left home before he came back. When someone as scary and menacing as Rumpel is telling you that someone is to be feared, you better listen. [Peter Pan and Rumpelstiltskin's relationship is a] slow reveal, but one that will come within those first 11 episodes. Even though she'll be 17 forever, time is what matures us. She certainly has a lifetime of experience in the last season. Yes, I think that she's evolving. I think that this season — while there's definitely still that youthful — I like to think of Jessica as irrepressible, that you can't really get her down. These terrible things happen, she does terrible things, she feels horrible about them, but somehow she's able to rally her spirits and start again. I find that to be a really admirable quality. I think [in] this season that comes off in a big way. She's gonna be really tested to see if she is mature enough to pick up the pieces and start again because every season she seems to be alone and looking for someone to be there for her and we'll see who it is. Here's a three-minute preview for Brian K. Vaughan's summer series adaptation of the Stephen King novel. The title of Under The Dome episode 1.10 is "Let the Games Begin." Some things that happen in the episode: Julia discovers more information about what her husband Peter did. Linda tells Junior his probationary period is over and now he's a full-duty police officer. Barbie is in a fight at the cement factory that some of the townspeople bet on. Here's a sneak peek at the first four minutes of the next episode, "If I Ever Leave This World Alive."